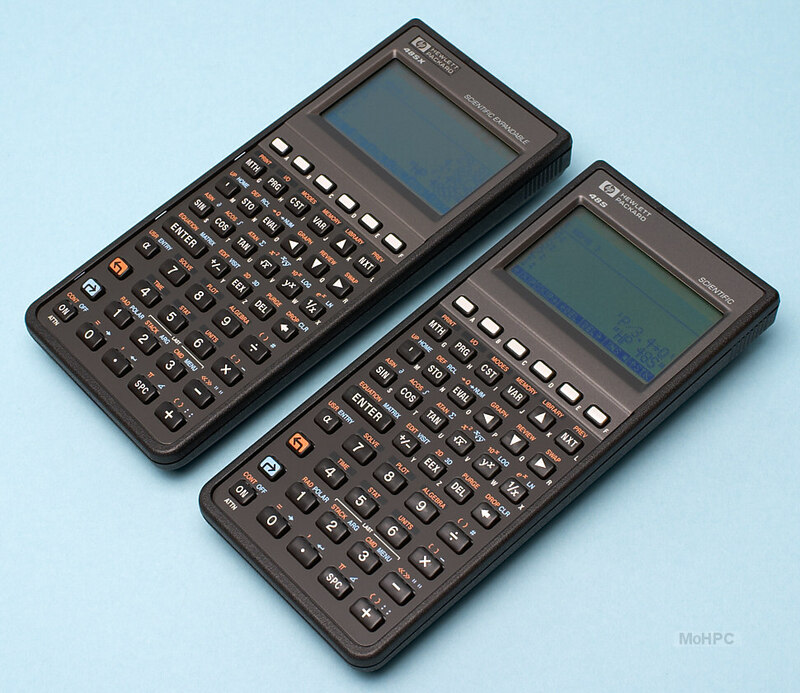 When HP created the HP-28C, it brought the very powerful RPL system to hand held computing. RPL provided sophisticated features like symbolic math, named variables, structured programming and many other capabilities. 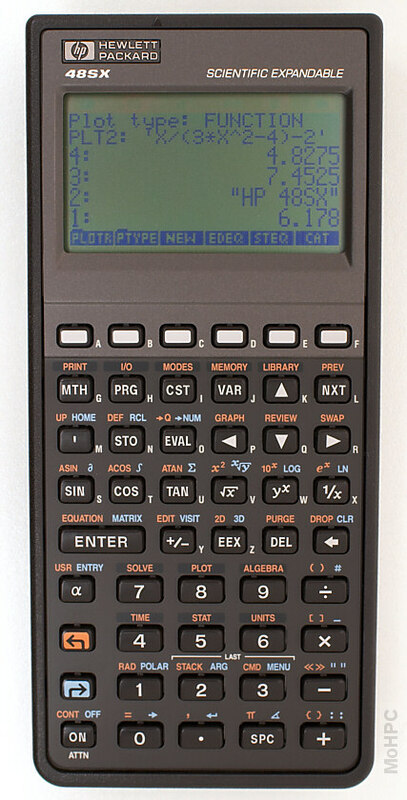 However, three features of HP's earlier top calculator, the HP-41C, were lost - expansion ports, a completely hand-optimized form factor and a fully reconfigurable keyboard. 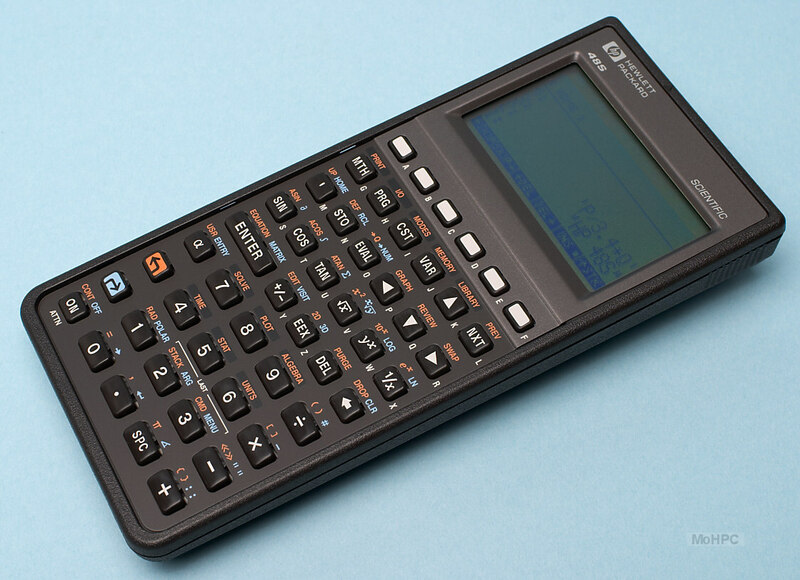 As the model number suggests, the HP-48SX combined the general expansibility, flexibility and form factor of the HP-41C with the advanced math and programing features of the HP-28C/S and added new features of its own. To understand the HP-48S/SX, the reader should first visit the RPL page. Many of the HP-48's functions are described there. 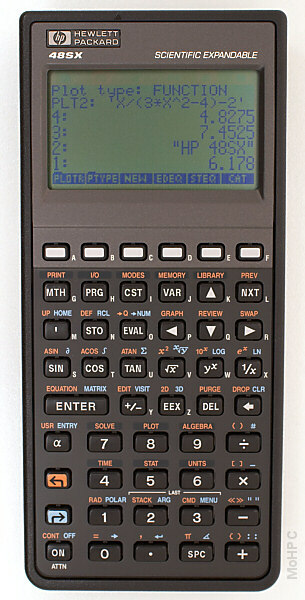 The HP-48 also included almost all HP-28C/S features which are not repeated here. The HP-48S/SX had a large 64 x 131 pixel display. It typically showed the current directory at the top, followed by four lines of the stack. At the bottom was a row of labels for the top row of soft keys. 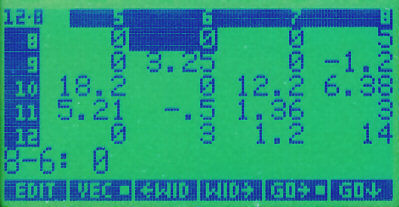 The large screen made plotting as well as features like the Equation Writer and the Matrix Writer more useful. A plot with plot-related soft key labels is shown. Though makers of algebraic calculators had claimed for nearly 20 years that their calculators allowed entry of expressions just as the were written on paper, this was never quite true. Early models were only vaguely "algebraic" but by the 90s most "algebraic" calculators could at least honestly claim that users could enter an expression in the way it would be typed into a compiler. The equation writer application finally allowed expressions to be entered and viewed just like they would be written on paper. The Matrix Writer application provided a convenient way to create and manipulate arrays. The screen looked much like a spreadsheet with a window of 5 rows by 4 columns which scrolled in both directions as needed. The column widths could be changed with the WID soft keys. Other capabilities included inserting and deleting rows and columns, reading and writing elements from the stack etc. To enter data, the user moved to each cell, typed the data and then pressed Enter. A second press of Enter saved the matrix on the stack. To edit an array on the stack, the user pressed the down arrow key which entered the Matrix Writer with the array from stack level 1 loaded. The new Interactive Stack feature gave the user an easy way to rearrange entries on the stack. After pressing the Up arrow key, the user could scroll through the stack. The Interactive Stack allowed the user to easily move elements around, copy elements in the stack or into the command line, delete groups of elements and to combine groups of elements into lists. 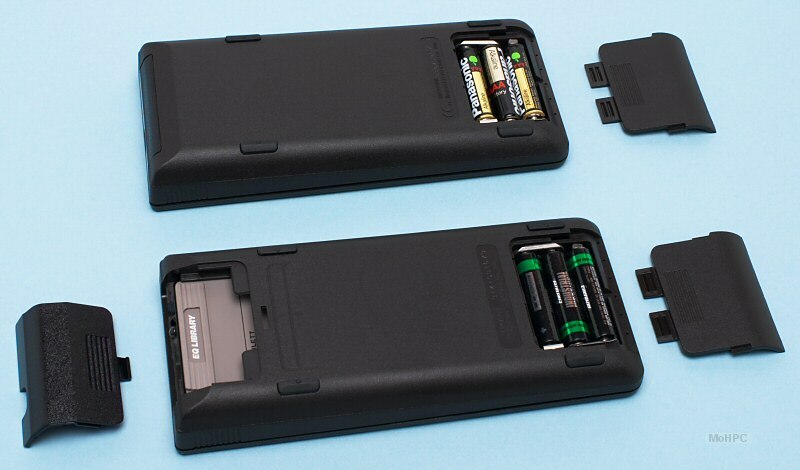 The user could also edit elements without moving them or trim the top of the stack. Then the user could press 20 UNITS SPEED MPH leaving 40_ft/s and 20_mph on the stack. Pressing + left a result of 47.27_mph. If the user preferred an answer in ft/s, pressing ft/s would display 69.33 ft/s. The Solver was fully unit-capable as well. To solve for a variable when the data had units, the user entered an initial guess including the desired units. Rather than an HP-IL-based network, the HP-48S/SX included a serial port. PCs and serial ports had become well-established by this time. 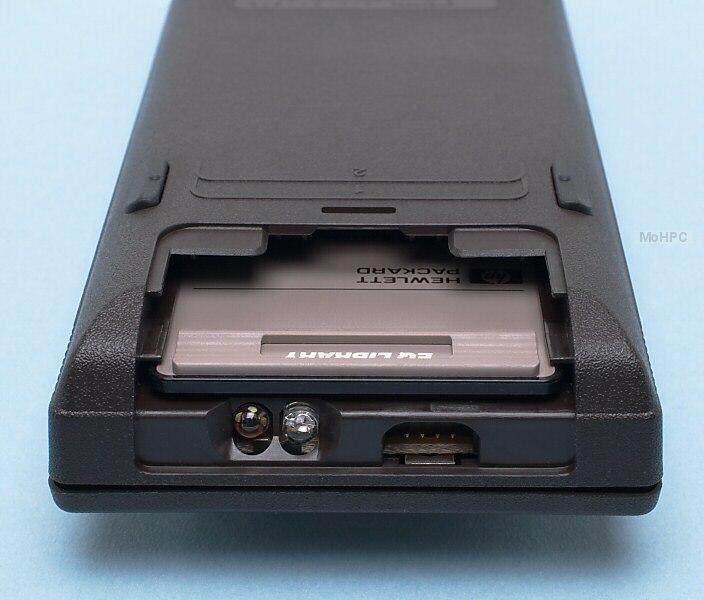 (Another company made a 3.5" diskette drive that could be accessed via the HP-48's serial port.) Serial port configuration was typically quite complicated at the time. The standard RS-232 port used a 25 pin connector and connecting devices would frequently require crossing certain pairs of signals or looping them back. The HP-48SX attempted to minimize this confusion by using only three wires (transmit, receive, and ground) and using the most common soft handshaking. The I/O menu made setting such parameters as baud rate, parity etc. easy. 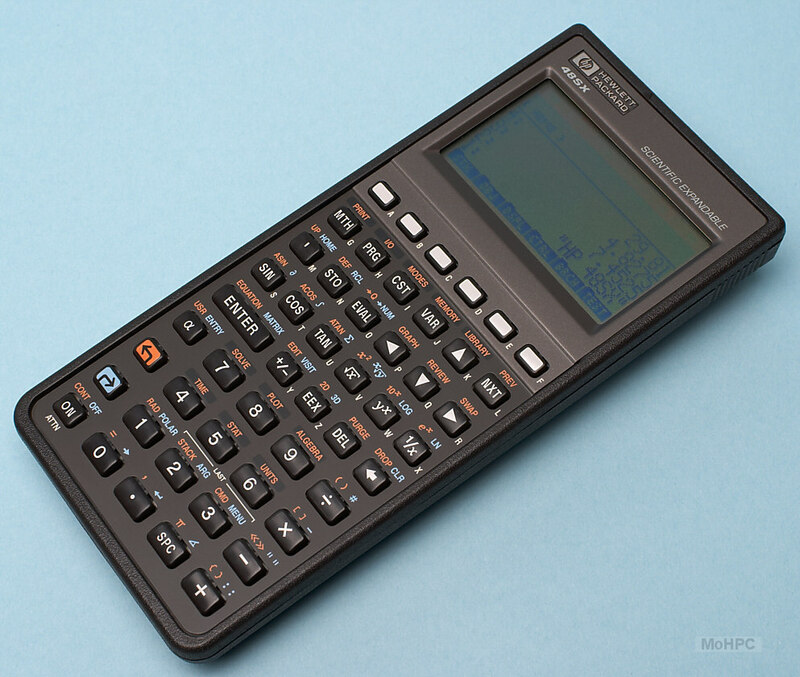 The HP-48SX extended the infrared output ability of earlier models to allow input as well. 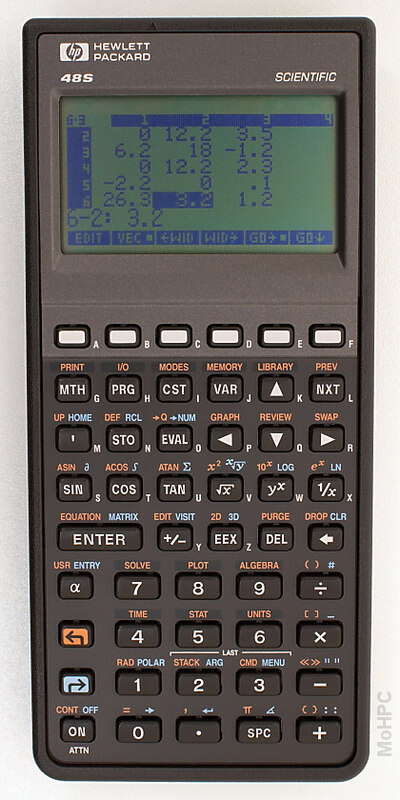 This allowed calculators to talk to each other and allowed some unusual applications such as motion sensors. HP limited the range of 2-way communication at the request of teachers who were nervous about invisible message passing. HP Solve-Equation Library card. Included over 300 equations, etc. Business Pac. Time Value of Money, Bond calculations, Black-Scholes, etc. Mechanical Engineering Application Pac and ME Reference Library. HydraTools. Solved pipe flow problems. Electrical Engineering Applications Pac and EE Reference Library. VERBB Circuit Analysis. Allowed circuits to be drawn on the calculator's screen and then analyzed. It was also possible to have custom software burned into cards. IR-based theft alarms / intrusion detection. 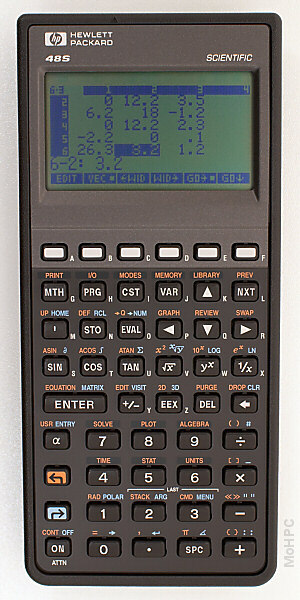 The HP-48SX was introduced first. The HP-48S was introduced the next year as a lower cost version. It had all of the HP-48SX features except for the expansion ports. Both versions used a Saturn architecture processor.